really good for new babies. Shivlu, John thank you for your comments and I’m glad that it helped. good one… helped me as well…as I am newbee in vrf world. Nice post. Do you have any idea where I could find some good information on creating a site to site VPN ASA to ASA? Thanks in advance. Hello just thought i would tell you something.. This is twice now i’ve landed on your blog in the last 2 weeks searching for completely unrelated things. Spooky or what? If you liketo exchange the links with us please let me know. What type of VPN? Many commercial clients such as Cisco have a setting that does just that. If you’re trying to do it with the Microsoft vpn connection, you’ll have to set it up as a service. The difficulty using Plr content is buyers do not make use of it effectively. People ought to either make use of it to find suggestions for things to write about or entirely re-write it or spin and rewrite it and afterward put his or her own identify on it. It's too bad Cisco chose to hack VRF into every single command that has to do with routing. That smells like a kludgy patch retro-fit. Now we always have to remember to tack the "vrf vrf-name" parameter onto everything! What they should have done is allow you to switch into a named VRF context, then from inside that do anything you would with a normal "physical" router, including show and config t. Oh well, gotta play the hand we're dealt I suppose. I like to practice VRF. I have two 2800 routers. Should I configure VRF on both routers or only on the the PE one?? the other router or also on the LAN interface fast 0/1 on which I connect my pc? If you’re looking for standard PE-CE relation in a MPLS environment, the VRF is configured on the PE side. The CE (customer) has not idea what a VRF. So, for your 1st question, you need to configure VRF forwarding on the Fa0/0 of PE router. Of course there are exceptions to the above standard. For example you, as customer, want to complete segregate the traffic in you own environment. 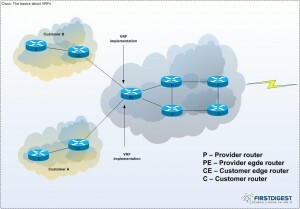 The provider is transporting up to the PE two VRF and you configure on your CE (either two physical connections to PE, or one physical connection with subinterfaces) VRF on the L3 interfaces to PE. This is called VRF lite and has nothing to do with MPLS VPN, as you configure only RD part under the VRF definitions. If you have the above approach, to answer your 2nd question, you can “push” the VRF in your environment down to the L3 point of you LAN (let’s say Core devices), so then you need VRF on the connection from CE to Core devices. It’s all about which path you’re taking and how do you want to structure your infrastructure. What I intend to do is very basic. Just connected two routers to each other in my lab to practice VRFs. There is no MPLS involved and no other networks or provider. I like to establish connection between two PCs, each of them connected to a router on a LAN interface and the two router are also connected in between by LAN interfaces via direct cable. I guess I need to configure the VRF lite you have mentiond on your reply. I configured EIGRP on both routers and ping is runnung between the PCs. As soon as I configure the VRF on both routers the ping stops. What do I miss? why has the ping stopped? in your case the answer is pretty simple. You have the interface in the VRF, but you’re advertising the IP subnets out of VRF (default routing table) inside EIGRP. You’re interfaces are on one routing table but you actually route your prefixes on another one.